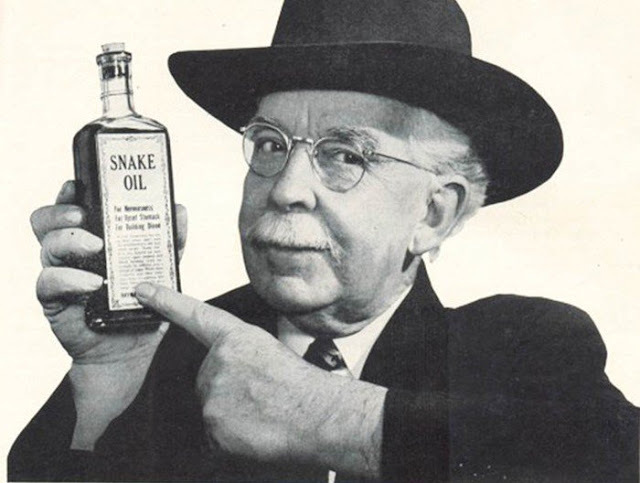 Don't you just hate these snake oil salesmen. Search Engine Optimisation (SEO) is the stock in trade of the new carpet-baggers, where sleazy web marketers will try to blind you with science claiming only they know the secret route to Internet El Dorado. What the hell is an 'organic search' anyway? "Also your traffic flow has dropped from last couple of months due to some of the reasons. You might know about recent Google PENGUIN 3.0 (Algorithm) UPDATES. Google has completely dropped all authorship functionality from the search results and webmaster tools. So be careful on it and give us such responsibility to fix it." There you go; blinding us with science. And bad grammar. Due to massive and low PR link building. Relevant keyword phrases are not visible on Google first page. Due to HTML validation errors and warnings present in website. Your website is not search engine friendly and not mobile responsive. Wrong, wrong, wrong, bozo; it's both. I designed it that way. Website content need to be revised. Nice and specific diagnosis there, doctor. Lack of social media promotion. Are you even looking at the same site? We will give you 1st page ranking on Google, Yahoo, and Bing of your relevant keywords. Excuse me if I call BS on that. Improve your organic traffic and make strategy for conversion. There goes that organic word again. Pesticide-free websites - the way to go. Fix your broken link issues and creating Incredible Content That Earns Links. Yeah - I don't think I'm going to let anyone who writes in Capitalised Marketing Sound Bites anywhere near my content. Secure your website from Google penguin and panda updates. A big padlocked gate to protect me from all that pesky wildlife, excellent. Target your local market to increase the direct sales. Which text book are you cribbing from, again? Note: We give guarantee to improve in your keyword ranking from the first month itself, if we fail to achieve then we will give additional one month free service. You guarantee? Can I have that in writing? Attention: Google Clarifies the Mobile-Friendly Algorithm Will Roll out over a Week so before Google hit your website, make it mobile mobile responsive. Give 100% attention to safe your website. Now you're just spewing out meaningless garbage. Are you also a Nigerian general with several $million to get out of the country? To get a free website audit report or quote, please reply soon. We have 24x7 (365 days), so you can contact any point of time with your website issues. Ah, I see, you're actually Time Lords; if you can contact any point in time, can I arrange that dinner party with Einstein, Marilyn, Julius Caesar and Elvis?